For the past two years I've had the great honor of hosting Dr. James Isabirye while he pursued a Ph.D. in Music Education at Oakland University. James has completed his program, writing a brilliant dissertation on his work in Uganda revitalizing indigenous music education practices. He heads back to home in 10 days. But before he goes, James will be sharing his music (including some of the traditions from Busoga and Buganda that he has helped revive) as the featured artist in our annual fall semester world music concert at Oakland University. I just returned from beautiful Quito, Ecuador where I took part in Estudio de Percusión’s XII Festival Internacional de Percusión. At the festival I had a blast teaching and performing with some of the greatest (and craziest!) percussionists on the planet. The faculty included Anders Åstrand from Sweden, Evaristo Aguilar from Mexico, Jholman Caceres from Colombia, Cesar Gonzalez Cisnero from Venezuela, and Carlos Alban from Ecuador. All of the Ecuadorian students worked really hard and we presented several exciting performances together. I’m bringing the wonderful vibe of this Ecuador festival back to Michigan tonight, August 25th - 8pm, with two sets of original music featuring Stone Sound Collective at Pontiac’s Little Art Theatre. Please check out this great article about the show in the Oakland Press. Tickets for the performance can be purchased here. Looking ahead, I will be kicking off the new school year with a special concert celebratingInternational Peace Day on Friday, September 21st. Established by a United Nations resolution in 1981, the International Day of Peace provides a “globally shared date for all humanity to commit to peace above all differences and to contribute to building a culture of peace.” This solo program will feature a range of globally-inspired percussion pieces featuring the newly-invented Array mbira, an American-made 120 key lamellaphone, as well as several traditional melodic African instruments, including the Ghanaian gyil, Ugandan akogo and South African kalimba. I hope to see you tonight in Pontiac! The memorial for Bernard Woma in NYC last month was a beautiful celebration of Bernard’s life and music. His funeral in Ghana will take place this weekend and we will also be celebrating his life with another memorial in Michigan this Sunday at Oakland University’s Varner Hall. We will begin at 3pm with a potluck meal and music making outside Varner Recital Hall (or in room 110 if it rains) and at 6pm there will be a memorial in the recital hall. If you would like to celebrate Bernard’s life with us, please attend, bring a dish to share, and join us in the music! I’m really excited to have several upcoming opportunities to share the music of my new ensemble, Stone Sound Collective. We will be performing tomorrow at Nardin Park United Methodist Church (8pm) and again on Saturday at Rochester Municipal Park’s Kiwanis Pavilion (1pm). Both of these events are free. The Nardin Park performance is part of their long-running summer concert series and the Rochester Park performance is the kick-off event for a new community coalition, formed to start a conversation about diversity and inclusion in the Rochester area. Looking ahead to August, Stone Sound Collective will be performing two sets of original music at the historic Pontiac Little Art Theatre on August 25th at 8pm. This grand venue (built in 1868) has been lovingly restored into a beautiful performing arts space. Tickets can be purchased in advance here. To learn more about the collective creativity of this new project and to receive regular updates on our performances and recordings, please like our Facebook fan page here. I’ve also created a short video montage of our music that can be viewed here. Wesley Dyring (violist in the Seattle Symphony) and I have prepared a special concert this Saturday at the Baha’i Center in Ann Arbor. This wonderfully diverse program will include a set of Western classical chamber music, a set of traditional Latin-American compositions, and a set of my original music - including the premiere of my newest piece Zisheh Neshomeh (sweet soul). Wes and I will be performing together with an all-star group of musicians including Bob Schneeweis on piano, Marcia Hilden Anderson on clarinet, Matt Dufresne on saxes, Miles Brown on bass, as well as Dan Piccolo and Alex Dyring on percussion. If you are in Michigan, please join us for this unique, not-to-be-missed concert! Admission is FREE and refreshments will be served after the program. Later this month, I will be headed to Johannesburg, South Africa to take part in Education Africa’s International Marimba & Steelpan Festival. I participated in this event two years ago as a clinician/adjudicator and I’m delighted to be invited back for the 2017 festival. This powerful event includes around 2,000 marimba & pan players from all over Africa. Check out a special CNN Inside Africa segment on the festival here. Jo’burg friends, I look forward to connecting with you soon! Finally, a big thank you to everyone who attended and participated in our recent Soul Food program in Pontiac. It was another joyous celebration of diverse cultures and spiritual traditions. You can read a great article by Nancy Palus about Soul Food II here. Wishing you a summer filled with joy, music, family, and friends. We are presenting our second Soul Food event this Sunday in celebration of Mother’s Day. Soul Food II – Honoring Our Mothers will take place at the Pontiac Creative Arts Center on May 14th at 3pm. As with our first Soul Food event in January, this program will focus on feeding our souls through the healing power of music. The concert will feature Spoken Word accompanied by the Middle Eastern Oud, South Indian Bhakthi, a Bach Cello Suite, Jazz, and Gospel. I hope you can join us for another inspirational and spiritually uplifting afternoon of music. Please help spread the word about this community event! Percussion Ensembles, Bhakthi, Ray Holman, and Soul Food! The winter semester at Oakland University has been a joyous whirlwind of teaching and music making. We’ve reached the peak of the semester with four exciting concerts in the next week. Tonight, we begin with our percussion ensemble/ world percussion ensemble concert - A Journey to Latin America, inspired by my trip last summer to Ecuador. Tomorrowevening, we explore the mystical Bhakthi music of southern India with special guest artists Chitra Srikrishna, Jay Balan, and Vinod Seetharaman. Then next Friday, we have two concerts with our featured guest artist from Trinidad, legendary steel pan composer/performer Ray Holman. Ray will be presenting a morning children’s program and an evening concert with OU’s world music ensembles - Akwaaba and the Pan-Jumbies. Our Soul Food event, which took place this past January, was a huge success. You can read a wonderful article about the event here. Because it was such an inspirational and spiritually uplifting afternoon, we have decided to do it again! Our second Soul Food event will take place at the Pontiac Creative Arts Center on Mother’s Day, May 14th at 3pm. The theme of the program is “Honoring our Mothers” and it will once again be a free event focused on feeding our souls through the healing power of music. We are looking for sponsors for Soul Food with the hopes of making this an ongoing series. If you, your business, or someone you know would be interested in sponsoring this initiative through the non-profit Pontiac Creative Art Center please contact me. As always, thanks for supporting the music and I hope to see you at an upcoming show! I ended 2016 with a life-changing journey to complete the Dagara Gyil Goba Initiation in the Upper West Region of Ghana. Having studied the gyil xylophone for the past 25 years, completing this initiation was a major milestone. I am deeply grateful to my mentor, friend, and jumbie brother, Bernard Woma, along with his extended family, for seeing me through this epic journey. Photos from the initiation can be found here. While in the Upper West of Ghana, I also participated in the Kukur Bagr Festival with Bernard's Saakumu Dance Troupe. Photos of this beautiful two-day celebration can be found here. The Goba Initiation concluded a powerful year of spiritual reawaking for me, which began last January when I became a member of the Baha'i Faith and included the miracle of my son Paxton's birth and subsequent life-saving surgery. In 2017, it is my goal to channel this spiritual growth as a Baha'i, father, and Goba into both my music and community work. As I attempt to meet this resolution, I'm kicking off the new year with two very special events. This weekend, fellow Pontiac Arts Commissioner Dwayne Anthony and I are organizing our first Soul Food event. The purpose of this free event is to provide encouragement to our community through the healing power of music. Six different groups, representing a diverse range of cultural and spiritual traditions, will share their music and its message of peace and unity. The program takes place at the Pontiac Creative Art Center, located at 47 William Street, this Sunday, Jan. 22nd, at 3pm. Then next Saturday, Jan. 28th, I will be hosting a workshop and performance by Spirits Rising at Oakland University. 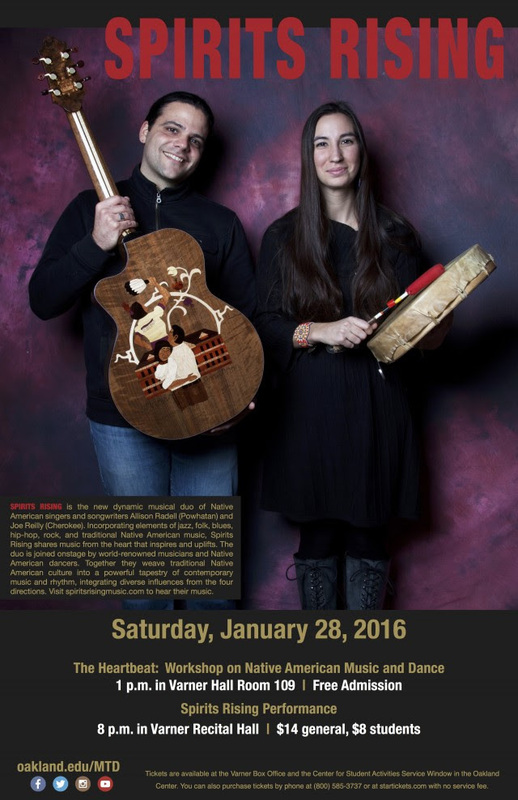 Spirits Rising is the new dynamic musical duo of Native American singers and songwriters Allison Radell (Powhatan) and Joe Reilly (Cherokee). Incorporating elements of jazz, folk, blues, hip-hop, rock and traditional Native American music, Spirits Rising shares music from the heart that inspires and uplifts. The duo is joined onstage by world-renowned musicians and Native American dancers. Together they weave traditional Native American culture into a powerful tapestry of contemporary music and rhythm, integrating diverse influences from the four directions. The free workshopbegins at 1pm in room 109 Varner Hall and the concert begins at 8pm in Varner Recital Hall. I hope to see you at one of these special events! Friday, 11/11 - 2pm, Percussive Arts Society International Convention with Bill Summers @ Indaiana Convention Center, Room 120. The fall semester is grooving right along. I’m very grateful to teach so many dedicated and energetic students at Oakland University. The success of my own teaching is built upon a foundation given to me by many generous teachers who have shared their musical passion. It is truly a privilege to get up every day and pass this rich gift of music on to the next generation. The month of November is quite special, as I will be working together with three of my musical mentors. My very first professor at the University of Ghana back in 1992 was the multi-talented Paschal Younge. In addition to being a master Anlo-Ewe drummer, Paschal is a highly accomplished composer and brass band director. It is my great pleasure to welcome Paschal Younge to Oakland University for a residency this week, culminating in aconcert at Varner Recital Hall on Friday night, featuring the Akwaaba African Ensemble, Ngoma World Percussion Ensemble, Pan-Jumbies Steel Band, and Afram Jazz Band. Then on Saturday afternoon, we will be presenting a free workshop and African drum performance at the Pontiac Creative Art Center. The following week, I will be at the Percussive Arts Society International Convention in Indianapolis with two more of my wonderful teachers. On Thursday, I will be presenting a World Percussion Lab on Dagara Xylophone Music entitled “Learning Dagara Gyil” together with my long-time mentor and collaborator Bernard Woma. And on Friday, I will be performing Bata’ together with acclaimed percussionist Bill Summer's and his group Iroko. I hope to see you at one of my upcoming events! This weekend I’ll be kicking off the new school year with a special concert at Oakland University featuring Regina Carter and the Oakland Jazz Quartet. We will be reinterpreting compositions from the classical music canon, ranging from Mozart to Reich. The program will include several arrangements from Regina’s 2003 album Paganini: After A Dream, inspired by her opportunity to play the celebrated virtuoso’s violin. It will also include two of my Astor Piazzolla arrangements from my 2008 album Piazzolla plus 5. Tickets can be purchased here. My trip to Ecuador this past summer was a wonderful experience. During my first week, I presented daily workshops and a concert at the Quito Percussion Festival, hosted by Carlos Alba of Estudio de Percusión and the Orquesta Sinfónica Nacional del Ecuador. Working and performing with co-presenter Cesar Gonzalez and the many festival participants was an absolute blast. During my second week, I traveled to Otavalo and the Chota Valley and learned about the rich Quechua and Afro-Ecuadorian cultures through the CIMAS foundation’s program “Wisdom of the Indigenous.” I am deeply grateful for this marvelous experience. Throughout my Ecuador trip, I enjoyed a lot of quality time with my predecessor at Oakland University, Prof. Emeritus Marvin “Doc” Holladay. Doc and his awesome wife Diane hosted me at their home in Cumbaya. I also greatly enjoyed hanging out with OU alum Walt “Dr. Detroit” Szymanski while in Quito. Photos from our adventures can be viewed here. I also snuck away one morning to a recording studio where I recorded Paxton’s composition “Heart Warrior,” which can be heard here. All events for the remainder of the year have been posted on my website. I hope to see you soon. This past month was intense, the most challenging of my life. I am thrilled to be getting back to playing some music in the month ahead. My son Paxton Lloyd Stone was born on May 26th with an undiagnosed congenital heart defect. Thankfully, my awesome wife and Paxton’s pediatrician realized things were not right. At 11 days old, Pax underwent heart surgery at the University of Michigan Mott Children’s hospital. The operation was a success, and he spent the next 10 days of his life recovering at U of M. During this traumatic time, we received an incredible outpouring of love from all over the globe. People of all spiritual backgrounds, including Baha’i, Christian, Muslim, Jewish, Hindu, and Buddhist friends, all prayed fervently for Paxton, sending him positive thoughts and healing energy. 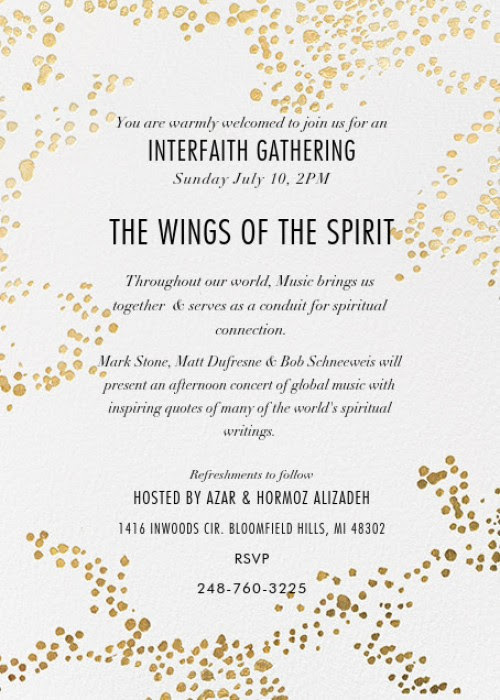 I will be celebrating Paxton’s recovery with a special interfaith concert this Sunday at the home of Azar and Hormoz Alizadeh in Bloomfield Hills. Saxophonist Matt Dufresne, pianist Bob Schneeweis, and I will be presenting a program of spiritually inspired works, including original compositions and pieces from John Coltrane's transcendental album "Meditations." Details, address, and RSVP information, can be found here and below. The program will include the premiere performance of “Heart Warrior,” written for my son Paxton. A sneak preview of Pax and I playing his piece can be seen here. Then next Wednesday, July 13th, the Southpaw Isle Steelband will be performing at 8pm as part of the Nardin Park United Methodist Church’s Summer Music Series in Farmington Hills. This free concert will feature exciting steelband music performed by Lesley-Anne Stone (lead pan), Pat Prouty (bass), Miguel Gutierrez (percussion), and myself (double second pans). More details can be found here. At the end of July, I will be traveling to Ecuador to present a solo performance and workshops at the 11th International Percussion and Educational Festival in Quito. I’m happy to be part of this weeklong event featuring a wide range of national and international percussion artists. I also look forward to exploring Ecuador’s vast musical and cultural scene after the festival concludes with Marvin “Doc” Holladay, my predecessor at Oakland University who has retired to Ecuador. I hope to see you at one of my upcoming performances. A big thank you to everyone who came out to support our Chennai fundraiser! Thanks to your generous support we were able to raise $1371 to aid musicians affected by the recent floods in Chennai, India. The next few months are super busy with all kinds of fun and creative performances. This Sunday, I will be hosting “An Afternoon of Carnatic Music” at Oakland University. The event will feature Kiranavali Vidyasankar (voice), Keerthana Sankar (violin), and Vinod Seetharaman (mridangam). They will present a workshop at 1pm, a pre-concert discussion at 3pm, and a grand classical concert at 4pm. Come on out to learn about and experience the beauty of Carnatic music. More information here. Then next Friday, March 4th, the Southpaw Isle Steelband will be performing at 7pm as part of the Chelsea First United Methodist Church’s Concert Series. This highly participatory family concert will trace the history of the steel pan and feature exciting steelband music performed by Lesley-Anne Stone (lead pan), John Dana (bass), Miguel Gutierrez (percussion), and myself (double second pans). More details here. The following Saturday, March 12th, I’ll be hittin’ with the Oakland Jazz Quartet as we accompany the Patterson Rhythm Pace Dance Company’s production of “Swingin’”, featuring vocalist Trish Shandor and music from Natalie Cole’s album “Unforgettable with Love.” Details here. Latter in the month, I have the distinct privilege of taking part in the annual Cleveland Tyagaraja Festival. This 12-day festival is the largest Indian classical music event outside of India. The entire festival is amazing! I will be featured together with Padma Shri awardee Aruna Sairam in “A Jazz-Carnatic Collaboration” on Friday, March 25th. The concert will take place at4:45pm on the campus of Cleveland State University in Waetjen Auditorium. Read complete festival details here. I hope to see you at one or more of my upcoming performances. It was great to see everyone earlier this month for Percussion Day at OU and at the Martin Luther King Day Celebration in A2. I just want to remind you that tomorrow night (Saturday 1/30) is our special fundraiser for musicians affected by last month’s floods in Chennai, India. This benefit is in collaboration with the Carnatica Archival Center, a Chennai-based non-profit. 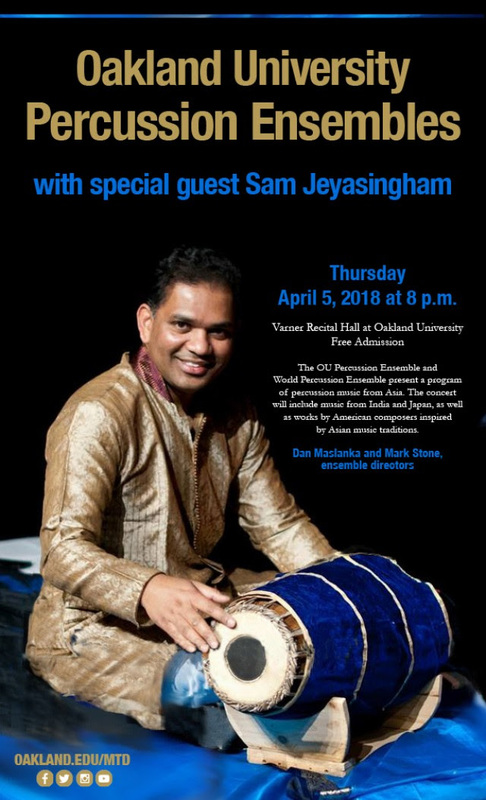 The concert will take place beginning at 7pm at OU’s Varner Recital Hall and will feature Michigan Jugalbandi, a group including myself (mbira/ gyil) along with fellow OU professors Sam Jeyasingham (mridangam/ kanjira/ morsing) and Patrick Fitzgibbon (tabla/ drum set) as well as OU graduate student Matt Dufresne (saxophones). Michigan Jugalbandi’sperformance will be followed by a traditional Carnatic performance featuring our region's preeminent Carnatic musicians: Madurai Sundar (voice), Jay Balan (violin), and Jannagan Jeyakumar (mridangam). Our co-sponsor, the Great Lakes Aradhana Committee (GLAC), Michigan’s premier Carnatic music presenter, will collect donations at the door. All funds raised will be sent directly to the Carnatic Archival Center in Chennai to support Chennai-based musicians, many of whom lost everything in the recent floods. As GLAC is a non-profit, your donations are tax deductible. Also, if you are not able to attend but would still like to make a donation, donations can be made online here. Wishing you a joyous and blessed New Year! Year-end concerts with Bernard Woma, Doc Holladay, my trio, Joe Reilly, and the OJQ were a blast and I am most grateful to the many people who took home a copy of my new CD at these shows. If you have not yet picked up a copy, get one here. I’m thrilled to kick-off 2016 with some particularly meaningful musical events. This Saturday at Oakland University, together with my OU colleagues Dan Maslanka, Sean Dobbins, Patrick Fitzgibbon, Sam Jeyasingham, and Michael Medvinsky, I will be hosting our signature percussion event: Percussion Day. This year, Percussion Day will feature workshops on concert percussion, steel drums, drum set, South Indian drums, East African xylophone, and a special guest jazz vibraphone workshop with Joe Locke. And if that wasn’t enough, students can also get feedback on solo & ensemble pieces or other material through individual lessons with Dan, Sean, Patrick, and myself. This yearly event is open to all ages and skill levels and will take place January 9th from 9am to 6pm at OU’s Varner Hall, rooms 134 and 110. View the complete schedule hereand please spread the word! With the many challenges we face as a nation, I believe that this month’s Martin Luther King Day must be celebrated more passionately than ever. Come celebrate Dr. King’s legacy by attending a special “couples” performance of the Biakuye Percussion Group on Jan. 18th, at the Ann Arbor Downtown Library. This 2 pm all-ages MLK Day event features Chinelo Amen-Ra and his wife, accomplished dancer Ambyr Amen-Ra, along with myself and my wife, gifted musician Lesley-Anne Stone. I am also taking part in two notable fundraisers this month, the first for the community of Pontiac, and the second for the community of Chennai, India. I will be performing as part of a fundraiser for I Can! Education and Enrichment Center of Pontiac. I Can! is run by my former student, Georgie Williams. Georgie is passionate about the arts and its power to transform communities. This grassroots organization is doing great work, especially for the youth of Pontiac. Their fundraiser will take place on Friday, January 15th at Oakland University’s Varner Recital Hall at 7:30pm. Then on Saturday, January 30th, I am hosting a benefit concert for victims of last month’s devastating flooding in Chennai, India. If not for a last-minute cancellation, I would have been in India during these floods, which killed several hundred people and displaced thousands. The affected and displaced also includes musicians, many of whom lost not only their homes, but also all of their instruments. As a way of supporting my adoptive Indian music community, I have organized a benefit concert for musicians affected by the Chennai floods. This benefit is in collaboration with the Carnatica Archival Center, a Chennai-based non-profit. The concert will take place beginning at 7pm at OU’s Varner Recital Hall and will feature Michigan Jugalbandi, a group led by myself (mbira/ gyil) with fellow OU professors Sam Jeyasingham (kanjira/ morsing) and Patrick Fitzgibbon (tabla/ drum set) as well as OU graduate student Matt Dufresne (saxophones) and mridangam artist Vinod Seetharaman. Michigan Jugalbandi’s performance will be followed by a traditional Carnatic performance featuring Michigan’s preeminent Carnatic musicians: Madurai Sundar (voice), Jay Balan (violin), and Vinod Seetharaman (mridangam). I hope you can attend one or more of these special events. Thanks to everyone who came out to support my CD release concerts last month! We had a great time playing and sharing the music. If you have not yet picked up a copy of my new album it is now available for download on CD baby. This week I am thrilled to be hosting Marvin "Doc" Holladay and Bernard Woma at Oakland University. Doc is the professor who started our world music program forty years ago. In my work at OU, I have been most fortunate to build upon the solid foundation that he created so many years ago. Doc has also had a stellar career as both a jazz musician and ethnomusicologist. Bernard is my mentor from Ghana with whom I have collaborated since 1992. The knowledge that he has so generously shared with me over the years is central to my teaching. Bernard is a dynamic percussionist and the foremost gyil (Ghanaian xylophone) performer in the world. 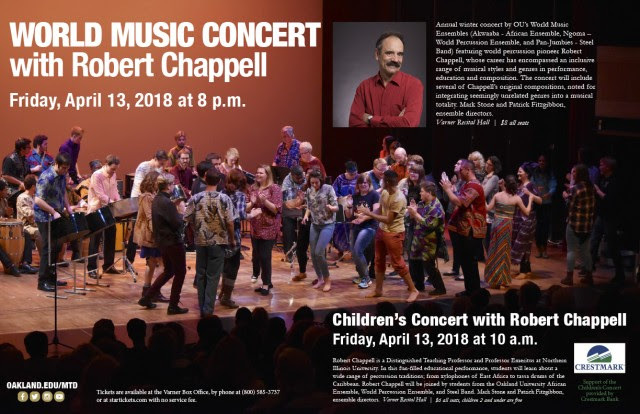 Together with my colleague Patrick Fitzgibbon and our wonderful OU students, we will be celebrating 40 years of world music at Oakland University with two concerts this Friday. Tickets for the morning concert are available here. Tickets for the evening concert are available here. For those of you attending the Percussive Arts Society International Convention in San Antonio, I will be playing with my trio on Thursday, Nov. 12th. We will be presenting a clinic/performance titiled, "New Music for Mbira, Tabla, and Violin." Our presentation will take place at 2pm in room 214 of the Henry B. Gonzalez Convention Center. As the weather cools and we enter fall, I am thankful for a joyful summer of travel, music making, and time with family. My trips to South Africa and Uganda were awesome. I had the honor of being an adjudicator and clinician at the International Marimba and Steel Pan Festival in Johannesburg. With more than 1,600 participants from all over Africa, the festival was an absolutely exhilarating experience! I then continued on to Uganda to work with Haruna Walusimbi and his group Nile Beat Artists. The highlight of my trip was visiting my friends and teachers in Nakibembe village, Uganda. Words cannot express the happiness I felt in being reunited with the Nakibembe Xylophone Group after 18 years and seeing them carrying on their beautiful embaire tradition. During my visit, Haruna took a photo of me with the group, which so clearly captured the moment that I decided to use it as the cover of my new album (a video I recorded of the Nakibembe group can be viewed here). And that brings me to my major accomplishment of the summer: I finished my new CD! Please come and celebrate with me this weekend – Friday October 9th at Oakland University and Saturday October 10th at the Carr Center in Detroit. This Friday’s concert is at OU’s Varner Recital Hall. Tickets are $14 general and $8 students and can be purchased online or at the door. Saturday’s concert is at the Carr Center, 311 E. Grand River Ave. in Detroit. The Carr Center is located just behind Music Hall and a suggested donation of $10 can be made at the door. My new CD will be for sale at both events, so come by and pick up a copy. The album, entitledKakaire, includes 11 original compositions/arrangements for global percussion and strings. 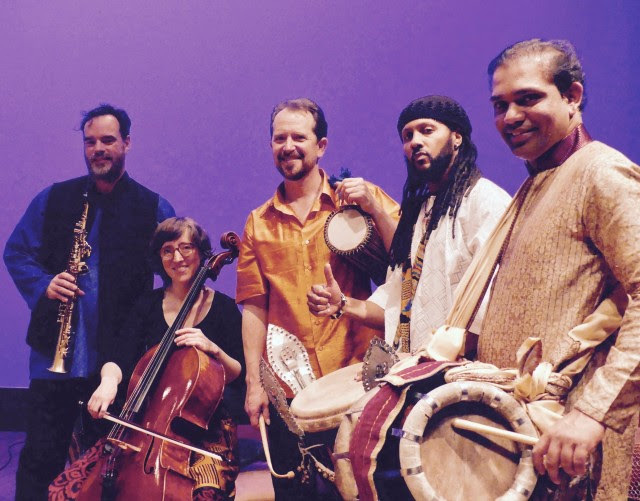 It features violinists Regina Carter, Raghanvendra Rao, and Alan Grubner, percussionists Tiruvarur Vaidyanathan and Dan Piccolo, bassist Miles Brown, and multi-instrumentalist Haruna Walusimbi. You can listen to a sneak preview of the CD here. After an incredible three months of performing, teaching, and recording together, I dropped off Haruna Walusimbi at the airport last week to head back to Uganda. During his time in the U.S. we visited ten states, gave 25 performances, had countless good times together, and even performed with Bela Fleck, one my musical heroes. Wherever we went, Haruna delighted audiences with a rich treasure trove of Ugandan music and dance. It was a joy to watch my students at Oakland University soak up Haruna’s deep knowledge of East African traditions throughout his residency. He made a lasting impression on all of us through his generosity, kindness, and ever-positive attitude, especially my three-year-old Ellery, who misses Uncle Haruna’s constant akogo playing. A week later and I am now headed to Africa myself to perform with the Bernard Woma Ensemble as a featured artist with the Kwazulu-Natal Philharmonic in Durban, South Africa. I’m excited be making a return trip to Durban to give African premieres of the Gyil Jumbie Concerto and the Gyil Yeru Concerto. Our performance will take place this Thursday at Durban City Hall. As soon as I return from South Africa, some of India’s finest Carnatic musicians will be arriving in Michigan for our 5th Annual Sarovar Indo-American Festival of Performing Arts. 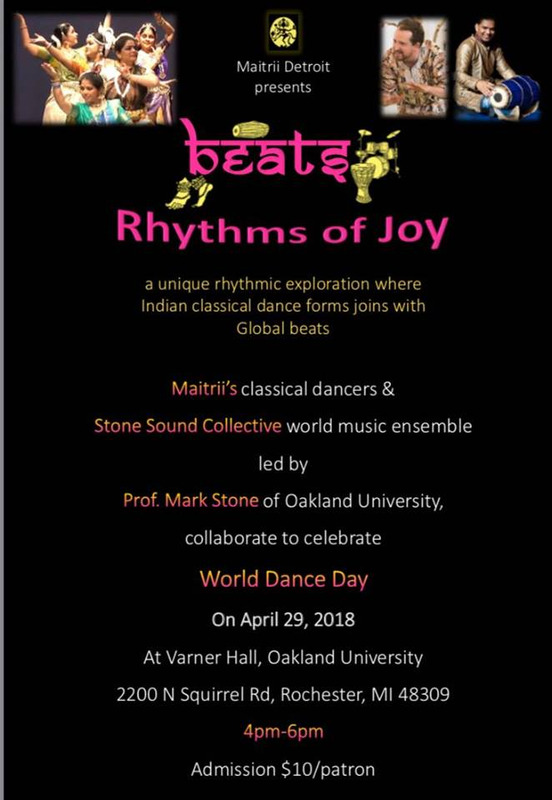 In addition to hosting the festival at Oakland University, I will be performing with the Vibrations Ensemble on Saturday, May 30th, and Percussion Jugalbandi on Sunday, May 31st. The Vibrations Ensemble is made up of many of the musicians I worked with during my sabbatical last fall in India, and this is a rare opportunity to hear the group in Michigan. Percussion Jugalbandi is a new project with my OU colleagues Sam Jeyasingham and Patrick Fitzgibbon, as well as local mridangam expert Vinod Seetharaman. A full schedule of all the great events taking place throughout this three-day festival can be found here. Then as we head into June I will have four performances with the Mark Stone Trio featuring Alan Grubner and Dan Piccolo. During these performances, I will be sharing some of my new compositions for the group, written this past fall while on sabbatical. We will be performing two full sets of my music at the Ann Arbor Canterbury House at 2pm on Sunday, June 7th. My trio will also be presenting three concerts together with the Sounding Light Chorale directed by the great Tom Trenney on June 5th, 6th, and 7th. Each concert will take place at a different Michigan church beginning at 7pmand will feature the trio performing alone and with the chorale. Details about the concerts can be found here. I am blessed to have these opportunities to play such a wide range of music with so many incredible musicians. I do hope you can make it out to one or more of the shows. It has been wonderful to host my Ugandan brother Haruna Walusimbi at Oakland University for the past two months. After not seeing one another for nearly 18 years, we have had a lot to catch up on. Together we've done plenty of traveling, performing, and teaching including: a Brooklyn Concert, New Jersey City and Manhattan School Performances, a West Virginia University residency, Eastern Michigan University masterclass, Michigan school performances, and a collaborative concert at Cleveland State University with friends from India and Michigan . Please come out this weekend to one of three concerts at Oakland University to experience Haruna Walusimbi's amazing work with my students. These shows are not to be missed and I am very proud of my OU students for their musicianship and dedication to learning Haruna's music. Here is a sneak peek of our program from an appearance yesterday morning on Fox 2 Detroit. Later in the month, I'll be performing with Joe Reilly and some of my favorite Michigan musicians to celebrate Earth Day. I also have additional performances scheduled with Haruna at the Ann Arbor Library and at the University of Wisconsin. I hope you can make it out to one or more of these programs. Thanks for supporting the music! After an exciting and refreshing sabbatical I’m ready to get back to teaching. In addition to my performance and research travels, I was able to get a lot of composing done and I look forward to sharing some new music with everyone in 2015. My experiences touring the UAE and India were truly life-changing. I had the opportunity to collaborate with so many incredible musicians whose generosity of spirit and creativity enabled me to grow as both a musician and person. There is also a video from the final performance of my residency at Ohio University that can be viewed here. I’m kicking off this new year with several events that I hope you can attend. This Saturday, Jan 10th, I will be hosting a full day of percussion workshops at Oakland University. This free event is open to the public and will include workshops on technology, concert percussion, drum set, steel drums, Indian percussion, and African percussion (register here). Then next Saturday, Jan 17th, the Oakland Jazz Quartet will be performing with Regina Carter at the Carr Center in Detroit. This concert with Regina features the music of Jimi Hendrix (get tickets here). Finally, I will be celebrating Martin Luther King Day (Monday, Jan 19th) with a free family performance by Biakuye at the Ann Arbor Library. Looking ahead, my Ugandan brother Haruna Walusimbi will be making his first visit to the U.S. this February. Haruna is an incredible performing artist and will be in residence at Oakland University for three months. He is available for school workshops and concerts throughout his stay and we will be doing both an East Coast and Midwest tour. Please contact me if you are interested in scheduling a performance or workshop with Haruna on East African ngoma (music, song, and dance) during his visit. Fall may still officially be a few days away, but it has definitely arrived here in Michigan. And what an incredible fall it is! For the first time in 40 years I am not in school but instead enjoying the best perk of a career in academia: a sabbatical! The purpose of a sabbatical is to give profs like myself some time off from teaching to pursue research. I’m really taking advantage of this opportunity and am busy preparing for exciting research trips to Uganda and India in October and November. But I love teaching and just can’t stay away! I just finished my first of two residencies at the other OU (Ohio University - photo above), taking part in “Experience Percussion” with the Mark Stone Trio. I’ll be back again early next month to present the Embaire – Xylophone Music of Busoga as part of Ohio University’s “Global Excursions.” If you are in the Athens, OH area, my presentationwill take place on 10/8 in the Recital Hall and the final performance will be at Memorial Auditorium on 10/11. I’m also looking forward to doing some guest teaching while in both Uganda and India. Before I take off on my big adventure, there are still a few more shows friends in Michigan can catch. This Saturday my steelband, Southpaw Isle, will be performing a 2pm FREE family concert at the Ann Arbor Library, Pittsfield Branch. Then the following Sunday, 9/28, I’ll be playing with the Scott Gwinell Jazz Orchestra as part of a special combined performance with the Motor City Symphony Orchestra at the Macomb Center. To kick off October, I’ll be joining the new group Spirits Rising, led by Joe Reilly and Allison Radell on 10/4, as part of the Native American Heritage Celebration in Detroit. My friends in Uganda and India, I can’t wait to catch up with all of you! In Uganda, I’ll be hosted by Haruna Walusimbi; in India, I’ll be hosted by KN Shashikiran. Details on my performances and workshops abroad will be posted here once everything is finalized. As summer winds down I have great gigs coming up this Wednesday and next Wednesday. On 8/20 I’ll be playing with my trio as part of the Lathrup Village Concert Series. Then on 8/27 I’ll be playing in an all-star band led by Joe Reilly at the Detroit Zoo’s Wild Summer Nights Concert Series. I hope you can make it to one of these shows! For those who like to plan further ahead, Sept. and Oct. events are posted on this website. Finally, I’m excited to announce that I’ll be leading an OU Alumni trip to South Africa in March. This trip is open to OU alum, OU faculty and staff, as well as “friends of the university.” So all my friends, you are most welcome to join. You can read all the details here and shoot me an email if you are interested in traveling to South Africa. Enjoy these final weeks of summer! I had a great week in NYC with my trio project. In addition to playing at the New School as part of the ISIM festival and at Somethin’ Jazz Club, we went into the studio to begin work on a new recording on the Jumbie Records label. I want to send a big shout out to Alan Grubner and Dan Piccolo for their awesome musicianship and for helping me to realize my musical vision. This Saturday is officially “World Music Day”, an event now celebrated around the globe. To celebrate in Michigan, I have a series of events happening throughout the week. On Wednesday the Mark Stone Trio will be performing as part of the Lathrup Village Summer Concert Series at 7pm. Michele Ramo will join me on mandolin and violin while Dan Piccolo will join me on tabla, frame drum, and drum set for this free outdoor performance. Then on Thursday my student groups will be presenting their summer world music concert at Oakland University, performing music for the embaire xylophone and pan-round-de-neck steel drums. This concert is also free and will take place at noon in the Varner Courtyard outside of Varner Recital Hall. Finally, this weekend Regina Carter will be in residence at Oakland University together with the Oakland Faculty Jazz Quartet. On Saturday and Sunday we will offer Jazz Workshops in Varner Hall from 9am to 4pm. The workshops will include two days of activities including combo rehearsals, listening classes, African xylophone sessions and more at the bargain rate of just $20. I hope you can celebrate World Music Day (Week) with me by attending one or more of these events. This weekend, I will be hosting the 4th annual Sarovar Indo-American Festival at Oakland University. The festival kicks off with the incredible Trichur Brothers on Friday at 7pm (who blew me away when I heard them two years ago in India) and continues through Sunday. For the complete festival schedule click here. Then, during the first weekend of June, my new trio will be making its NYC debut with performances at the ISIM Festival and Somethin’ Jazz. Our performance at the International Society for Improvised Music Festival will take place on Friday, June 6th at 2pm, New School University - room 613. The theme of this year’s festival is cross-cultural improvisation, a perfect fit for my group. On Saturday, June 7th I will be performing at Somethin’ Jazz with both Imaginary Homeland and my trio. Imaginary Homeland hits at 7pm, the Mark Stone Trio plays at 9pm. If you like to plan your world music fix in advance, I my complete summer schedule is posted on this site. Finally, I have posted a video below of my recent performance with the Carnatica Brothers and the legendary South Indian musician Dr. M Balamuralikrishna for everyone to enjoy. I absolutely love how music can transport you to another time or place. For the past two weeks I have been in India (even though the furthest I traveled from home was Cleveland.) I was transported to India through numerous rehearsals with my friends the Carnatic Brothers along with several concerts and workshops all culminating in a performance with the legendary singer, Dr. M Balamuralikrishna. It was a great couple weeks and my understanding of Carnatic music deepened considerably. I’m looking forward to actually traveling to India for more performances with these great musicians this November. Now it’s time to return to my Michigan roots through performances this weekend with two of my favorite singer/songwriters, Joe Reilly and Lesley-Anne Stone, along with the wonderful Michigan jazz artists Marion Hayden, Gayelynn McKinney, and Alison Radell. We will be performing together this Saturday and Sunday in a group led by Joe at the Detroit Zoo’s Green Fest – two set both days (Noon and 2pm). Then next weekend, Saturday May 3rd, I am thrilled to be part of the Downriver Day of Percussion. This all-day event will take place at Roosevelt High School (540 Eureka Rd., Wyandotte, MI 48192). Students from middle school through early college can register here to participate in the event. Registration fee is $20.00 and includes an evening concert. I will be presenting an embaire xylophone clinic at 10:55am and will be performing at the end of the day at 6:30pm. Please spread the word to curious young percussionists! I want to share with you some of the wonderful music events that I will be part of in the next couple of months. In March, I will be in residency at both the University of Wisconsin – Oshkosh and the University of Michigan – AnnArbor. At the University of Wisconsin, I will be hosted by Alison Shaw and the UW Oshkosh Percussion Program for workshops on the East African embaire xylophone and a concert on the West African gyil xylophone. At the University of Michigan, my new trio will be hosted by Kwasi Ampene and the Center for World Performance Studies, presenting both classes and concerts. In AnnArbor, the Mark Stone Trio will be performing at the University of Michigan Museum of Art on March 13th and the Canterbury House on March 14th. In April I will be hosting several incredible performances at Oakland University. During the first week of April, we will have the great Trinidadian jazz trumpeter and composer Etienne Charles in residence at OU. Etienne will perform on the annual world music concert on April 4thand with the OU big band and pan-jazz ensemble on April 5th. 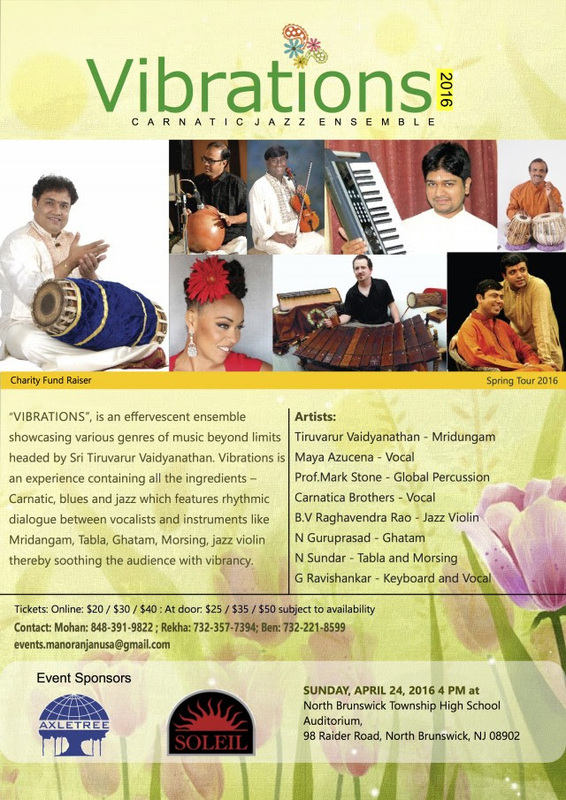 Later in April the virtuoso Indian musicians P. Ganesh and K.N. Shashikiran, known as the Carnatica Brothers, will be visiting our campus, culminating with a performance on April 19th. Happy New Year! I hope you had a wonderful holiday season. I enjoyed the Christmas break at home, spending lots of quality time with my little girl Ellery. The concerts at the end of last year with Bill Summers and our presentation at the Percussive Arts Society International Convention were fantastic. You can view the full PASIC presentation here or if you just want to watch part of it, here is our performance of Twalibamukwano. Also, the prezi I presented at PASIC is here and excerpts of our concert with Bill can be found on my youtube page. 2014 is off to great start with Percussion Day at Oakland University this coming weekend and performances with Regina Carter and Biakuye the following weekend. Percussion Day is a free event hosted by Oakland University on Saturday, January 11 from 9am to 6pm. Register here and read all the details below. On Saturday, January 18th I will be performing with the Oakland Jazz Quartet, the Oakland Chamber Orchestra, and Regina Carter at 8pm in Varner Recital Hall. The concert will feature a new composition I just completed for gyil xylophone, jazz quartet, and chamber orchestra. The following Monday, January 20th, I’ll be celebrating Martin Luther King Day with my African percussion group, Biakuye, at the Ann Arbor Library. This all ages show is free and features my good friend Sulley Imoro, an incredible dancer from Ghana. I have two shows this week at Oakland University with the amazing Bill Summers! Tuesday's faculty concert features Bill with the Oakland Jazz Quartet playing bata and Latin Jazz. 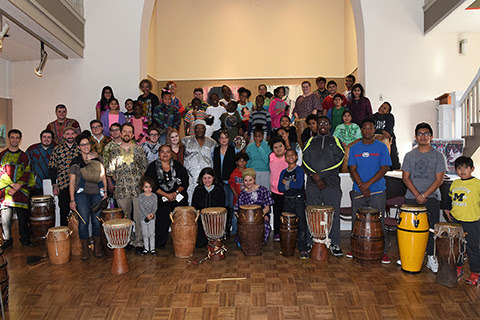 Friday's concert features Bill with the Oakland University student groups Akwaaba (African Drum Ensemble), Ngoma (African Xylophone Ensemble), and Pan-Jumbies (Steel Band). Both concerts take place at Oakland University in Varner Recital Hall at 8pm. $14 - general admission. $8 - students. Later this month I will be giving a research presentation at the Percussive Arts Society International Convention. I will be presenting the Embaire - Xylophone Music of Busoga, Uganda together with students from Oakland University. Our presentation takes place on November 14th at 2pm at the Indiana Convention Center in Indianapolis. This will be the first embaire performance at a PASIC so if you are at the conference please come and check it out! I’d like to give a big thank you to everyone who came out to support the debut performances of my new trio last month. For those who couldn’t make it out (or if you would like to hear it again) the entire concert at Oakland University was recorded and has been posted to Sound Cloud. Enjoy! This month Jumbie Records will be releasing a new CD by the NYC-based world jazz group Imaginary Homeland, which I have played in for many years. We will be giving our CD release concert at Trumpets Jazz Club in Montclair, NJ on Sunday October 20th with sets at 7:30pm and 9:00pm. I’m really proud of this new CD. Friends in NY/NJ come check it out. Finally, if you are interested in joining me for a trip to Ghana next summer, I have two informational meetings this week at Oakland University: Wednesday 10/9 at 8pm or Sunday 10/13 at 4pm. Both meetings take place in Varner Hall room 134. Earn 4 undergraduate credits in International Studies or 2 graduate Music credits. Check out this Prezi I made of the program with photos from our last trip! It’s been a great summer with lots of fun steel drum gigs and time spent with my beautiful family. I also taught my international studies class at Oakland University (Intro. to Africa) and in August was officially promoted to the rank of Associate Professor with Tenure. I am happy to kick off the new school year with three exciting shows. 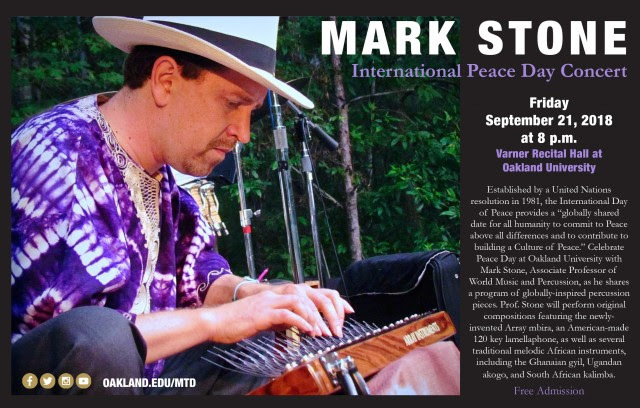 On September 14th and 15th I will be debuting my new group, the Mark Stone Trio. We play at the Michigan Festival of Gourds on the 14th at 1pm with a workshop at 3pm. This is a very cool festival, which I also participated in last year. There are many artists on hand who make all kinds of things from gourds and proceeds support the Children's Hospital of Michigan Foundation. Then on the 15th the trio performs at Oakland University’s Varner Recital Hall at 4pm. Inspired by my trip to India last November, the Mark Stone Trio uses a traditional Carnatic setup of a soloist with percussion and violin accompaniment. However, the group’s original music draws on a wide-range of compositional influences, including American jazz and African mbira/marimba music. In the trio, I will be joined by violinist Alan Grubner and percussionist Dan Piccolo, whose dynamic playing runs freely across musical boundaries. The following Sunday, September 22nd at 4pm, the Southpaw Isle Steelband will be giving a special performance at Detroit’s International Institute with drummer Leonard King. The show will also feature a guest appearance by bassist Miles Brown. Rounding out the lineup are regular members of Southpaw, Miguel Gutierrez on percussion with Lesley-Anne Stone and myself on steel pans. We will be performing with steel drum virtuosos Andy Narell and Liam Teague on the same weekend, April 12th to 15th. This is going to be an unbelievable weekend of steel pan music and everyone is very psyched to work with these two panmasters. On Friday, April 12th Liam Teague will be performing with Oakland University's Pan-Jumbies on the campus of OU in Varner Recital Hall, with shows at 10am and 8pm. Then on Saturday, April 13th the Southpaw Isle Steelband will be performing a 7pm show in Waterford at Community Presbyterian Church. And for the grand finale on Monday, April 15th. Oakland University's Pan-Jazz will be performing with Andy Narell, calypsonian Lord Relator, the Steelheads Steel Orchestra, and the MSU Jazz Orchestra on the campus of Michigan State University, concert to take place at 7:30pm at the MSU Community Music School. I hope you can make it to one or more of these great shows. Thanks for supporting steel pan music in Michigan! Wishing everyone a wonderful 2013. I am starting out the year with a performance by Imaginary Homeland at Somethin' Jazz in New York City followed by our annual Percussion Day at Oakland University. This year's percussion day features our OU percussion faculty along with guest artist Miguel Gutierrez and an evening concert with Southpaw Isle.